Hey -- if that's why this is in the news, them more power to them. It's not simply stump fodder, as Cutter portrays it to be; it was a troubling and yet-unsolved breach of national security. It should be getting airtime, and what's more, the Obama Administration's foreign affairs policy should be receiving some skeptical attention. It's fast becoming clear that threats weren't taken seriously -- threats for which Stevens himself requested help -- and as Guy reported earlier, even family members of the dead haven't received answers. The tragedy never should have occurred to begin with -- not with sufficient embassy security -- but now that it has, it's also been mishandled at every turn. Officials at the highest level of the Obama Administration have distorted the facts -- most glaringly, in blaming a ridiculous YouTube video for the violence. This was a policy failure, and as the man who wishes to become our nation's top policy maker, Romney is well within his rights to question how Obama and co. have dealt with the disaster. He's addressing an issue that many Americans are concerned about, and feel the president has handled poorly. 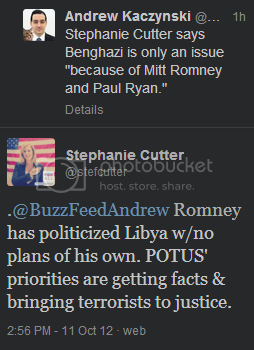 So for a moment, I'll give her the benefit of the doubt, and say that Cutter means Romney is trying to use this issue to make Obama look bad. But that's not even true -- he'd look bad regardless of whether another candidate for his office challenged him on it. The facts about what they knew and when, and the ensuing public relations disaster speak for themselves. For her to sit there and simper into a camera about how Romney is "reckless and irresponsible" about reacting to Libya takes a lot of guts. It was her boss' reckless and irresponsible strategy that landed us here in the first place. Well, that whole "getting facts" line is not terribly accurate -- see any one of the links above -- and accusing Romney of having "no plans of his own?" How about this: he's in adamant opposition to the sequestration cuts to our national defense, set to take place January 2, 2013, and which would include a $129 billion cut to embassy security worldwide. It certainly seems like preserving and strengthening security at our embassies worldwide is a solid step in the right direction -- and it's clear which candidate has an eye to accomplishing that.